Become a Festival Member with a minimum monthly donation of $20 or more. Your important annual contribution supports both annual Festivals, our free Children's Literacy Programs and a wide range of other activities and programs throughout the year. For monthly payment options for our annual or semi-annual memberships please contact Leslie Wilson at 613 562-1243 or leslie@writersfestival.org. Half-Year Memberships, available now, are valid until August 31, 2019. Each Membership ensures at least 80 more students are able to participate in our literacy programs. The Ottawa International Writers Festival is proud to launch a new initiative which grows organically from our long and fruitful relationship with Children’s and Young Adult literature and our successful partnership with the Ottawa-Carleton District School Board and the Ottawa Public Library. The Writers Festival was born in 1997, and in 1999 we introduced our writers-in-schools program which to date has welcomed well over 100 Canadian and international writers in all genres to more that 20,000 young learners throughout the OCDSB. The Republic of Childhood is a direct response from teachers, parents, librarians and of course kids themselves for a more intensive writing experience where kids would be front and centre in the delivery of books, stories and the writing life in general. Children are the future and we are Learning from the Future at the Republic of Childhood. • Free access to the majority of our programming - including access to the Spring Editions, PLUS our year-round events (except for Literary Luncheons and other food events & workshops). • Front of the line: Be the first to know what's coming up and no need to wait in line for tickets ever again. • Reserved Seating: Call ahead for exclusive reserved seating for you and your guests at any Festival event. Give us at least 48 hours notice, and we'll guarantee you one of the best seats in the house! • 10% off book purchases during the Festivals and all our special events. • Special invitations to exclusive events, receptions and celebrations. To become a Festival Member, please email Leslie Wilson or call us at (613) 562-1243. You can also sign up for membership using our online Membership Form. For each additional Member you refer, we are pleased to thank you with two free tickets for the event(s) of your choice - for you to use or to give to family and friends. Donations of $500 or more help us cover costs for your favourite author. It’s a great way to get involved, to support the Festival and an author of your choice! Patrons can be individuals, businesses, or groups such as book clubs or writing groups. Last year, thanks in large part to individual donations, more than 5,000 area children were able to participate in our free Children’s Literacy Programs! • and a warm thank you! You can also support the Festival by becoming a Festival Member or Corporate Sponsor. This year, thanks to donations from Festival Members, 5,000 area children are able to participate in our free Children’s Literacy Programs! 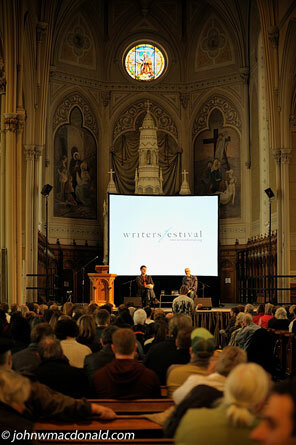 The Ottawa International Writers Festival is a registered charity. Your tax-refundable donations support our children's literacy programs, community outreach and our year-round programming! It's easy to add a donation to any online ticket purchase. If that is not convenient, please give us a call at 613-562-1243.